Qatar Airways continues its winning year as its revolutionary Qsuite was named ‘Best Business Class’ in the AirlineRatings’ Airline Excellence Awards 2019. The airline’s renowned dine-on-demand in flight cuisine was also named ‘Best Catering’. 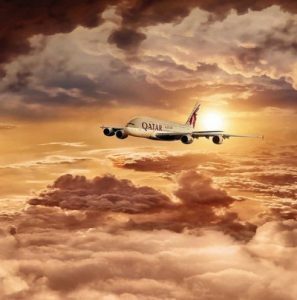 Airlineratings.com Editor-in Chief, Mr. Geoffrey Thomas, said: “Qatar Airways has always been a trendsetter by raising the bar, and its new Qsuite is the epitome of that drive and a natural choice as AirlineRatings.com best Business Class for 2019. Qsuite is a first-class experience in Business Class. Our judges rated it as one of the best overall business-class products they had seen. It sets a standard to which some airlines can only aspire. Qsuite, patented by Qatar Airways, features the industry’s first-ever double bed available in Business Class, with privacy panels that stow away, allowing passengers in adjoining seats to create their own private room. Adjustable panels and moveable TV monitors on the centre four seats allow colleagues, friends or families travelling together to transform their space into a private suite, allowing them to work, dine and socialise together. The spacious bespoke cabin, coupled with the ultimate customisable travel experience that enables passengers to create an environment that suits their own unique needs, sets a new standard in luxury travel. In May 2018, Qatar Airways introduced an enhanced onboard dining experience for its Business Class passengers. The new dining concept features newly-designed tableware, in-flight dining menus, cutlery and chinaware that are specially crafted to meet travellers’ high expectations and elevate their experience on board the airline’s award-winning aircraft. These awards add to a year of continued success for Qatar Airways, who was named ‘World’s Best Business Class’ by the 2018 Skytrax World Airline Awards. It was also named ‘Best Business Class Seat’, ‘Best Airline in the Middle East’, and ‘World’s Best First-Class Airline Lounge’. One of the world’s fastest-growing airlines, Qatar Airways currently operates a modern fleet of more than 200 aircraft flying to business and leisure destinations across six continents. The airline plans to launch a host of new destinations in 2018, including Gothenburg, Sweden; Mombasa, Kenya; and Da Nang, Vietnam.